Spurs for José follows the adventures of a young Indian vaquero, José Rodriquez, as the Mexican- American War erupts, gold is discovered at Sutter’s Mill, and California becomes the thirty-first state of the United States. Based on true events, the book fulfills the California Core/Content Standards for History-Social Science and providessupplemental reading for fourth, fifth and eighth grades. 5.8.6 Relate how and when California, Texas, Oregon, and other western lands became part of the United States, including the significance of the Texas War of Independence and the Mexican-American War. Why was their job important? Where did Tomas learn to be a vaquero? Why did Tomas leave the mission to work on the rancho? What was the main industry in Alta California in 1846? 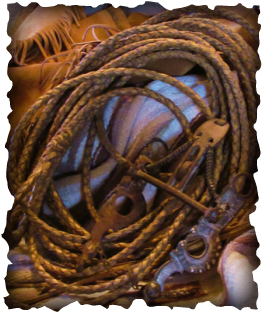 What was daily life like on a rancho? Why would an Alta California ranchero help Colonel Fremont? *Activity 1- Design A Brand. Materials needed- paper and pencil. The main industry of California’s rancho period was the hide and tallow trade. The valuable cowhides were called “California Banknotes.” With hundreds of ranchos and no fences, thousands of cattle freely roamed and a brand was needed to determine ownership.Today, we still brand cattle to establish ownership and register the brand just as they did during the days of the ranchos. share their ranch’s name and why they chose their brand. Divide the class into groups and have students choose a chapter from Spurs of José, and then write a reader’s theater script to be performed in class.